I received yet another phone call from someone who was trying to sort out the risks of staying pregnant versus the risks of being induced. From what the client could share, it was hard to know if the practitioner wasn’t fully informed on placental calcification at term, or wasn’t fully forthcoming about the non-clinical indications of that particular development in a healthy pregnancy. To be sure, there are times when the benefits of an induction to rescue a compromised baby far outweigh the short and long-term risks of an induction. Unfortunately, when trying to make an informed decision, clients often need to learn what their practitioners don’t know or won’t tell them. So let’s take a little tour of the placenta. To begin, the placenta is a fetal organ, meaning it is made from the same sperm and egg that makes the baby. As the baby grows and ages, so does the placenta. Both the baby and the placenta (which comes from the same genetic material) need to reach a certain level of maturity in order to be born healthy. The placenta does not suddenly expire when the pregnancy reaches an arbitrary number of weeks. When the placenta is not well, the baby is usually not well. When the baby is well, then the placenta is usually well. Sometimes, there are variations in the placenta that are more common in babies at risk and they might also be present in a healthy baby. So not all variations mean something is wrong every time. The placenta is a marvellous organ that has a maternal side that attaches to the wall of the mother’s uterus, and a fetal side where the umbilical cord arises to transport blood back and forth from the fetus to the placenta. The umbilical cord usually has 2 arteries (going away from the baby’s heart towards the placenta) and one vein (returning back to the baby’s heart). So while blood that is full of oxygen is usually flowing through our arteries, in the case of the umbilical arteries, it’s going away from the baby to the placenta with waste and then the umbilical vein returns to the heart with oxygen and nutrients that are supplied by the placenta. The surrounding Wharton’s Jelly protects these important vessels inside the cord. The mother’s blood and the baby’s blood don’t intermingle thanks to the wisdom of the placenta and the uterus working together. However, the baby gets all it’s nutrients from the mother’s blood stream and counts on mum to clean the waste the baby produces. Thanks to something called trophoblasts, which extend from the placenta into an area of the uterus where mum’s blood flows freely, oxygen and carbon dioxide and various nutrients and wastes are exchanged between mum and baby without baby’s blood and mum’s blood touching each other. Each of these “grades” has specific features that help the technician to “date” the placenta. One of the features of a Grade III placenta is that it often shows circular indentations that have calcium deposits (calcification). This is considered to be a natural part of the aging process in much the same way that our skin develops wrinkles as we age. And just as wrinkles in the skin of a person of any age doesn’t mean that this person is at risk of imminent death, neither does the appearance of calcification in a normal placenta at term mean that it’s about to expire (Harris, 2000; Jamal, 2017; Nolan, 1998). So where did this idea come from that calcification on a placenta meant it was dying? This notion has come from the observation and study of preterm births of compromised fetuses. 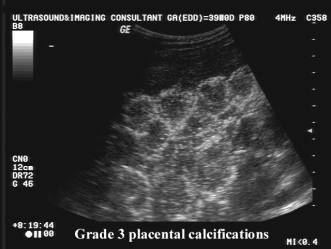 A compromised fetus that is born early often has a “grade III” placenta with significant calcification. So while calcification of a placenta at term – around 39-42 weeks is part of the normal appearance of a full-term placenta and has no clinical significance in a healthy pregnancy, the appearance of significant calcification earlier in pregnancy is associated with risks to both the mother and baby. Just like we would be concerned about a very young person with wrinkles – it could be a sign of something significant happening. Although, most every study has shown that calcification at term is normal and doesn’t mean anything in terms of negative outcomes for mum or baby, over the years, there has been conflicting evidence that early calcification was or wasn’t associated with poorer outcomes. That was because there were too many variables. In some studies, the mothers were smokers, which is associated with more calcification and more preterm births. In other studies, the mothers had hypertension, which can affect the health of the placenta and the baby. The studies were making comparisons on different ultrasound machines with interpretation by different technicians. However, if the placenta graduated to a “grade III” with calcification after 32 weeks gestation, then there were no increases in adverse outcomes. This was true whether the mother had other risk factors such as diabetes, hypertension, or smoking (Chen, 2012). Now let’s talk about those signs of “calcification” after the baby is born. Some placentas arrive with granular bumps across the maternal side and some parents are told that it’s a sign that the placenta was aging and starting to lose function. However, that’s not true for healthy full-term pregnancies. Those granular bumps are not calcium deposits, but rather infarcts, deposits of fibrin, which are bits of scar tissue that have formed over dead cells through the process of infarction. Fibrin appears as small yellowish-white deposits that are the result of interference in the blood supply to the placenta. Small placental infarctions (bumps of fibrin) are common in healthy full-term pregnancies and have no clinical significance. Only when there’s extensive infarction, meaning 10% or more of the placenta has died and been replaced by scar tissue is there an association with fetal growth restriction, fetal hypoxia, and fetal death, particularly if the infarctions occurred in the second and early third trimester (Mousa, 2000). So, in essence, when a mother is healthy and full term, calcification and infarcts are normal features of a healthy placenta – just like your healthy mother has some wrinkles and a few grey hairs. This is one more bit of misinformation, mis-education, or pure nonsense that needlessly frightens healthy mothers into risky inductions. Make wise choices, my friends. Becroft, D. M. O., Thompson, J. M. D., & Mitchell, E. A. (2002). The epidemiology of placental infarction at term. Placenta, 23(4), 343-351. Chen, K. H., Chen, L. R., & Lee, Y. H. (2011). Exploring the relationship between preterm placental calcification and adverse maternal and fetal outcome. Ultrasound in Obstetrics & Gynecology, 37(3), 328-334. Chen, K. H., Chen, L. R., & Lee, Y. H. (2012). The role of preterm placental calcification in high-risk pregnancy as a predictor of poor uteroplacental blood flow and adverse pregnancy outcome. Ultrasound in medicine & biology, 38(6), 1011-1018. Harris, R. D., & Alexander, R. D. (2000). Ultrasound of the placenta and umbilical cord. Ultrasonography in obstetrics and gynecology, 4, 597-625. Jamal, A., Moshfeghi, M., Moshfeghi, S., Mohammadi, N., Zarean, E., & Jahangiri, N. (2017). Is preterm placental calcification related to adverse maternal and foetal outcome?. Journal of Obstetrics and Gynaecology, 37(5), 605-609. Mousa, H. A., & Alfirevic1, Z. (2000). Do placental lesions reflect thrombophilia state in women with adverse pregnancy outcome?. Human Reproduction, 15(8), 1830-1833. Nolan, R. L. (1998). The placenta, membranes, umbilical cord, and amniotic fluid. A practical guide to ultrasound in obstetrics and gynecology, 438-439. Vinnars, M. T., Nasiell, J., Ghazi, S. A. M., Westgren, M., & Papadogiannakis, N. (2011). The severity of clinical manifestations in preeclampsia correlates with the amount of placental infarction. Acta obstetricia et gynecologica Scandinavica, 90(1), 19-25.